IMPORTANT - This event is free and open to the public, however, our theater has limited seating. For this reason, we ask you call 605-394-6923 to make a seat reservation in advance of the film premiere to ensure you are able to see this movie. 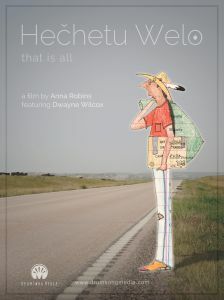 Come see the premiere of this short documentary about local, Lakota artist, Dwayne Wilcox and his beginnings on the Pine Ridge Reservation. FREE event with meet and greet starting at 6:00 pm and the program starting at 7:00 pm. Reserve your seat in advance by calling 605-394-6923. Q&A, raffle, door-prizes, and live music!